Can Dogs Eat Pretzels? Are Pretzels Good Or Bad For Dogs? Today’s question: can dogs eat pretzels? Are pretzels good or bad for dogs? Scroll down for detailed answers. Pretzels are enjoyed by most everyone in most every location. The fact that pretzels do not need to grow and are not dependent upon weather makes the pretzel such a universal food that no one is immune to their temptations. Pretzels are a dough-based product, famous for their soft center and harder glazed exterior. Flour and yeast are therefore the main ingredients. Pretzels go hand in hand with family activities and as reminders of our youth. The warm taste of a good pretzel is a comfort food and special treat in cooler months. Crispy, baked pretzels are one of the most universal foods due to the lack of spoilage, good taste, and lack of allergens. While the stories of the origin of pretzels are both varied and fanciful, it is generally agreed the pretzel came from Europe in the early middle ages. Brought to the United States by German and Swiss immigrants, the pretzel has rapidly become a firm favorite snack for the US market. Whether as a treat in the school lunch box, or nibbled on while enjoying a beer, the salty flavor and ‘more-ish’ quality means the distinctive knotted savory snack has become omnipresent in kitchens around the world. However, if the family is enjoying a pretzel, and the dog is staring with those big eager eyes, is it okay to share it with your four-legged canine friend? Do dogs love pretzels as their human counterparts do? Pretzels are not recommended to feed to your dog. 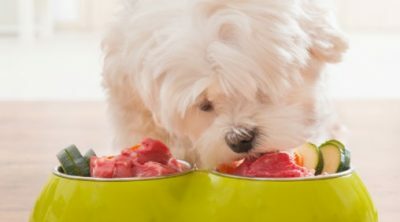 When trying to determine what foods to feed our dogs, and how we can indulge our pets in our gluttonous activities, we are bombarded with information about what a dog can and cannot eat. It can be easy to lose track of the foods that are deemed best for our favorite family member and which can cause death. With modern life equating to hectic lives, and continual time pressures, we are more and more likely to share our food with our pet, instead of taking time to prepare their own specific meals. 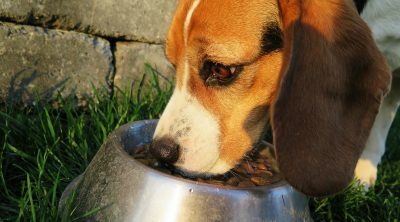 Feeding our pet food from our plate saves time and money for some who are short on both. Whipping up some eggs, sharing meat, and offering pretzels may be a good solution to some pet owners who have not been able to make the trip to the store to replace the empty kibble bag. In this situation, when we become overwhelmed with information on whether or not to allow table food to our dogs, we need to ensure the facts of foods are remembered and respected. We need to make sure we do not accidentally and literally kill our dogs with kindness. 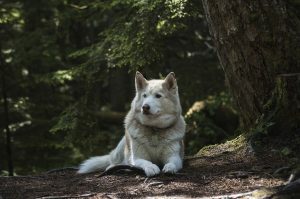 Human owners may be under the impression dogs have the ability to digest most anything and suffer little repercussion; this is not always the case. Depending upon breed and size of the dog, a pretzel may cause a reaction in your dog that you had not prepared for. While some have argued that a single pretzel does no harm, the safest answer is no, not really. One pretzel may do no harm, but how many people and dogs eat only one pretzel? How many dogs swipe a bag of pretzels off of the counter and eat only one? Very few. Therefore, you must take the count of pretzels a dog will eat into consideration when debating the sharing of food. 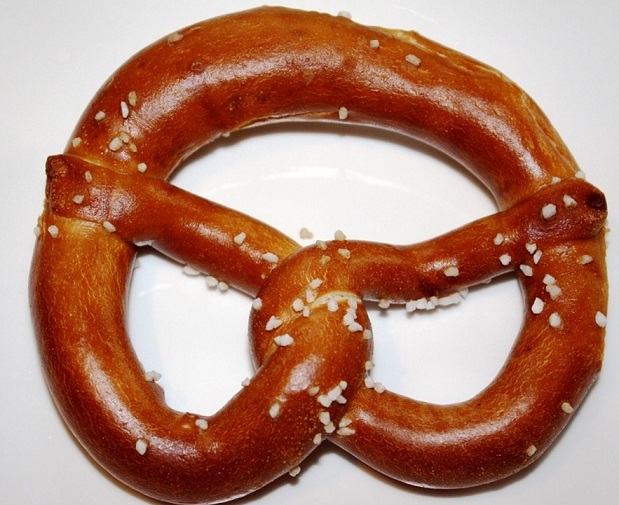 Salt is the most common seasoning for pretzels, which enhances their flavoring. It is the sprinkling of salt (usually rock salt) that really provides the flavor, and this is where the potential problems arise. Although the smell of fresh pretzels will have them sniffing, it is best to say no, however cruel it feels, for their own well-being. 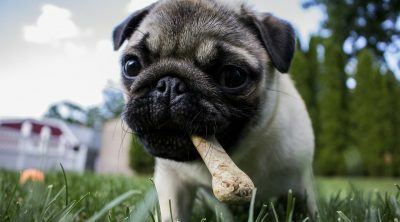 Saying no to a dog is so difficult that many cannot resist the temptation and end up putting their dog’s health at risk. Loving your dog sometimes means saying no and being stern. Not many people have ever heard of salt poisoning, or have been concerned of this condition in relation to their dog. Poisoning by salt is rare and not talked about much in health circles. While most people are aware salt can lead to high blood pressure and heart trouble, poisoning is not a side effect many think of. If salt can poison a human when ingested at high rates, think of the poisoning a dog may suffer. Dogs have smaller systems than that of humans and their bodies’ age much faster. A dog is unable to process high quantities of salt as their master can, thereby putting them at great risk for just a simple treat. While some salt is necessary for a healthy dog (depending on size and condition of the dog), too much salt can lead to sodium chloride poisoning, which in the most severe cases can lead to death. Small amount of salt/sodium are needed for the body to function correctly. 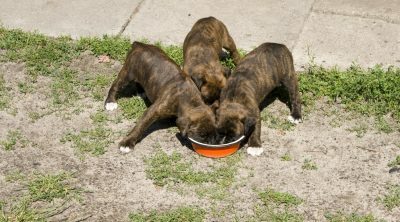 Regular dog food should allot for the safe amounts of sodium your particular dog needs. Occasional safe table foods may also be a source of sodium. These methods of obtaining the needed salt should meet the requirements recommended for salt intake. The dangers of salt can be high, and the symptoms may be misleading to you the owner as a simple cold, or an upset stomach. 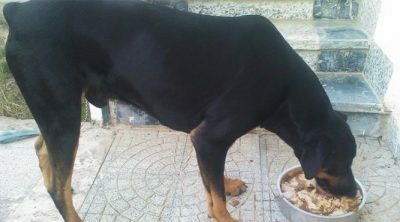 How salt is dangerous is that the salt in the dog’s internal system will begin to absorb water in the body placing unnecessary strain on the circulatory system and kidneys. With unnecessary strain on these areas, the strain can cause extreme health risk and even death. Symptoms to be aware of include vomiting, diarrhea, excessive thirst and urination, pronounced lethargy, appearing to walk drunk or disorientation, seizures and severe swelling of the body. When and if these symptoms occur, you must take you dog to a veterinarian immediate for treatment. We hear salt is enemy number one in dogs, but there are options for pretzels to be served without salt. What about these unsalted pretzels? While unsalted pretzels are undoubtedly a better option, many sweet pretzels can be just as dangerous. Pretzels themselves pose a risk whether the breaded food is salted or not. 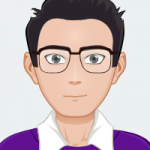 Which leads to the obvious question – why take the risk? Dogs do not NEED pretzels, or even benefit much from the food. Why bother risk the life of your dog so that you can feel your dog was able to enjoy the same comfort food you do? It is important to be aware of all the ingredients such as raisins, which are also toxic to all breeds of dogs. Raisin mixture may be added to the pretzel for flavor, then poison the dog directly, unbeknownst to you. Unsalted pretzels are definitely better than their salted cousin, but still not recommended, as they offer next to no nutritional value. On a positive note, there are safer alternatives to offering your dog salted pretzels or pretzels that contain raisins. Utilizing seeds rather than salt can help your dog avoid side effects and possibly obtain a bit of nutritional benefit from the seed. Depending on the seed, a dog may eat a small of this type of pretzel. Some pretzels may be seasoned with sesame seeds; these are not toxic to dogs and a much better alternative (though you may see them in the dog’s bowel movements). Poppy seeds are a different story and should be avoided at all costs. 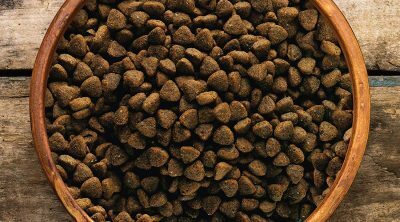 Poppy seeds are unquestionably toxic to dogs and no amount, however small is considered safe. Another common pretzel topping is cheese. The pretzel is big favorite with young and old alike, addictive almost in its taste and texture. And while the dog may hoover up any that fall on the floor, it is not recommended for their daily diet. While in some cases there is no problem, the dog may be able to tolerate the odd pretzel, and it will offer no nutritional value to the dog. A single pretzel is unlikely to have any repercussions, especially if the excess salt on the outer layer has been scraped off. However, as discussed earlier, a lot of the alternative toppings are also problematic such as poppy seeds, so this still has dangers unless you are completely sure of all the ingredients and confident in the labeling. Ultimately, with nothing to gain and a sick companion to potentially suffer, the advice is to keep pretzels away from your dog, swap it for something that is specifically catered for your dog that will give your pet the goodness it deserves. Depending on breed, age and physical condition of the dog, speak to your vet and find a more suitable, wholesome and targeted snack for your companion to enjoy while you and the family ‘woof’ down the pretzels yourselves.